This speedy and gentle breed has been a loyal one for centuries. Ancient Egyptian artifacts dating back to 2751 B.C. show a Greyhound-like dog hunting, while the earliest written accounts of the breed is shown in Greek poetry dating back to 43 B.C. The breed was described to be a hunting animal that rather than using scent to hunt, used sight and speed. The breed may have spread around the world by merchants throughout Iraq, Iran and Russia, and was probably introduced to England by the Celtic tribes more than 2,000 years ago. The Greyhound’s undisputed speed and hunting ability may have been what drew its popularity among the wealthy. It was even considered murder if a Greyhound was killed in past centuries, showing the value and bond between man and hound. Now, Greyhounds are known as racing dogs although this is a disputed topic between animal lovers and punters. The breed has not grown out of its speed and instinctual hunting ability, making it a perfect choice for racing. Greyhounds that are kept as pets are calm, placid dogs with good manners. They are very laid back, which may come as a surprise to those who think they are loud racing dogs. Greyhounds are intelligent and easy to train. They rarely bark and normally get along well with people and with other breeds of dogs. Yet another surprise Greyhounds spring on you is that they spend a lot of their time sleeping, unless something interesting is happening. So if you are considering getting a Greyhound, don’t expect to have to take them on hourly runs. 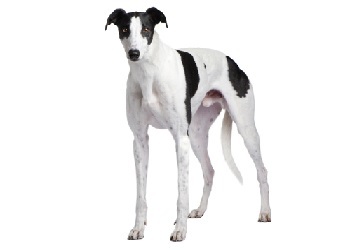 Be mindful that some ex-racing Greyhounds may be too hyperactive; therefore obtaining your hound from a reputable rehoming agency, such as Greyhound Adoption Program (GAP), as temperament testing is essential. Potential Greyhound owners will be pleased to know that they require little grooming due to their short coat. A brush once a week or fortnight is plenty. Due to their skin not producing much oil, a bath once every couple of months will be fine, as they don’t have a doggy odour – unless the dog spends a lot of time in the garden and gets dirty, in which case a bath once a fortnight will be sufficient. Known as the couch potato of dogs, Greyhounds are quite happy to take in the scenery and lounge around. However, when exercising, bear in mind that they have little endurance and are better sprinters. Generally, the dog can be content with a 20-minute walk daily. Like all dogs, Greyhounds require regular tick, flea, intestinal worms and heartworm treatments. Consult your veterinarian on treatment options. Desexing and vaccination against diseases, such as the deadly parvo virus and highly infectious canine cough, are also important to discuss with your vet. Due to its history and value with wealthy owners it appears that the breed has little to no inherited health problems. But if you are obtaining an ex-racing Greyhound make sure that you ask about their history and if they obtained any injuries during their career that you need to look after. Due to their laid back nature, Greyhounds are suited to a range of owners, including the elderly, families with both older and younger children, singles and couples. The Greyhound is tolerant of small children and prefers to walk away if the child becomes too boisterous, rather than compete for attention. However, like with any breed, small children do need to be taught how to behave around them. Greyhounds are suitable for apartment living if they get enough exercise. Because they do not have much body fat, they are sensitive to the cold and cannot live outdoors.